The St. Jude's Storm wasn't a hurricane, but it came nearly a year to the day after Sandy battered the United States' coastline from New Jersey to Rhode Island. And it was the worst storm to hit much of Europe in at least a decade. So named because it roared across the United Kingdom and into the European mainland Monday, which is St. Jude's feast day in some Christian denominations, the storm killed 15, caused millions of dollars' damage, and left hundreds of thousands of residents and businesses without power. It was another reminder that Europe is certainly not immune to Atlantic-bred storms. Some of the storm's fuel came from the remnants of Tropical Storm Lorenzo in the eastern Atlantic, but the system was a cold-core storm -- definitely not tropical. Meteorologists had plenty of warning, and the southern parts of Wales and England were on alert when the storm made landfall Monday morning. After ripping across the United Kingdom, the storm plowed into the European mainland, damaging northern France, Belgium, the Netherlands, Denmark and southern Sweden. Then it pushed eastward, battering the Baltic nations (Latvia, Lithuania and Estonia) before roaring into Russia near St. Petersburg. A 14-year-old boy playing in the surf on the southeast coast of England was washed out to sea. So was a woman on an island off the French coast. Nearly a dozen others were killed by falling trees. Travel across the English Channel -- both above land (ferry) and below (Eurostar high-speed train) -- was halted for several hours. Officials reported more than 270,000 power outages in Wales and England, and 30-foot waves battered the southern coast. Wind gusts of more than 100 mph were reported at gauges a short distance off the coast. There were numerous reports of winds gusting around 80 mph in northern Europe. About 100,000 power outages were reported in Latvia. At St. Petersburg, strong winds forced a rise in the Neva River, and the water level climbed 10 inches in an hour. The St. Jude's Storm pales in comparison to the system called the worst ever to hit the United Kingdom -- on Nov. 26, 1703. That storm had winds of about 80 mph, but it hit heavily populated areas in an era when storm protection was a rarity. As a result, about 10,000 people were killed in south central England. Tens of thousands of trees were blown down. Much of the Netherlands' coastal protection system was upgraded after a storm that struck Jan. 31 and Feb. 1 in 1953. Nearly 2,000 people died in that country when ocean water overwhelmed coastal communities. Another 2,000 deaths were reported in the United Kingdom and elsewhere in Europe. October freeze: The weekend cold snap produced the chilliest weather in the Carolinas this early in the season since 2006. The low temperature Saturday morning in Charlotte was 27 degrees (which was colder than where I was, north of Frederick, Md.). That set a record for the date, and only once in Charlotte weather history -- on Oct. 26, 2006 -- has it been so cold this early in the season. The 55-degree high temperature Friday was the chilliest maximum October temperature in Charlotte since a 53-degree high on Oct. 17, 2009. Southeast snow: You probably saw where snow fell in the North Carolina mountains Thursday, and there were even minor accumulations for a while in some of the higher elevations. You might not have realized, however, that more significant snow fell Thursday in the traditional "snow belt" areas along the Great Lakes. Several inches of very wet snow accumulated in the higher elevations southeast of lakes Erie and Ontario. Deep low pressure to the north of the Great Lakes was funneling a strong supply of cold, unstable air into the United States. When that unstable air crossed the Great Lakes, it picked up moisture and deposited it as snow on the shore, especially in the higher areas a bit inland from the lakes. Stormy week ahead: It looks like one of those strong autumn storm systems will push eastward across the United States over the next few days. It will plow into some rather mild air, and the result likely will be an outbreak of severe weather Tuesday and Wednesday in the Midwest and Mid-South. By Thursday, that low will drag a cold front, stretching from the Great Lakes into the South. Strong thunderstorms are likely again, but meteorologists aren't certain if the instability factor will be as high as it is expected to be Tuesday and Wednesday. Strong wind shear will accompany the front as it moves into the Carolinas on Thursday night. Right now, it's too early to know if there will be enough instability for severe thunderstorms to break out. But it's possible, and we'll have to watch the forecast unfold this week. Halloween: Those thunderstorms and the cold front will arrive a bit too late to do much damage to trick-or-treating Thursday evening. It's possible a few showers could arrive in the Charlotte region ahead of the main band of precipitation -- possibly as early as the evening hours. But most areas are likely to remain dry. It will be mild, too. High temperatures are expected to reach the low and mid 70s, and with ample cloud cover, conditions will remain warm Thursday evening, even after the sun sets. An evolving weather pattern could bring at least a temporary end to a Carolinas hurricane season that never really started. It's too early to stick a fork in the 2013 tropical weather season for our part of the country, but the forecast trend for the remainder of October is not the kind of pattern that would favor tropical storms or hurricanes along the Carolinas coast. A deep trough is forecast to set up shop over the eastern United States, and most long-range computer models predict the pattern will continue for the remainder of October. The trough will allow cold air to funnel southward, covering much of the area east of the Mississippi River. This pattern will bring some snow to the Upper Midwest and Great Lakes, as increasingly colder air moves into that part of the country next week. In the Carolinas, it will translate into clear skies, chilly temperatures and low humidity levels for much of next week. After an October with a steady diet of highs in the 70s and lows in the 50s and 60s, it'll be more like daytime highs of 65 degrees and morning lows in the lower 40s. At this time of year, the most common breeding ground for tropical storms and hurricanes is the Gulf of Mexico and the Caribbean Sea. 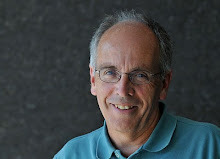 Accu-Weather posted an article article today in which meteorologist Dan Kottlowski says the changing pattern actually might foster development of tropical storm activity. But atmospheric steering currents would push any tropical systems either westward into Mexico or out into the Atlantic off the Florida coast. It's possible that rain from a tropical system could push northward into the Carolinas, but a direct hit from a storm would seem unlikely, given the predicted pattern. It probably will be early November before the new pattern relents, and by that time, we'll be thinking more about winter weather than hurricanes. Thousands of students and workers across the Southeast stopped what they were doing and ducked for cover at 10:17 a.m. Thursday. They were participants in the second annual Great Southeast ShakeOut, a drill which is part of Earthquake Awareness Week. Participants were practicing how they should respond in the event of an earthquake. I'm sure everyone in the Charlotte region realizes that the idea of an earthquake in this region is not far-fetched. Sure, we're not in a prime zone, but the ground has shaken many times in recent years. According to the ShakeOut website, at least two Charlotte schools -- Idlewild Elementary and McKee Road Elementary -- were among the participants. So were a number of business offices. More than 1.6 million people were expected to participate in Thursday morning's drill. In recent history, you probably remember the Aug. 23, 2011, earthquake which gave the Charlotte area a jolt. That quake, with a 5.8 intensity, was centered about 40 miles northwest of Richmond. It was the strongest earthquake in the eastern United States since 1897. The big one, of course, was the quake that hit Charleston on Sept. 1, 1886. That one had a 7.3 intensity, and it left at least 60 people dead. The quake was felt as far away as central Ohio and Havana, and it gave the Charlotte region a serious shake, according to reports at the time. In recent years, earthquakes have been reported in Charleston in November 1952, August 1959, March and July 1960, and October 1967. Authorities say a quake similar to the 1886 shake in the Charleston area would result in a huge loss of life, along with severe property damage. A 5.2 earthquake, centered near Waynesville (west of Asheville) was reported on Feb. 21, 1916. That temblor was felt several states away but did little damage. I've written before about the Dec. 13, 1879, earthquake that was centered in southeastern Mecklenburg County. That one had a 4.0 intensity. It's looking increasingly likely as if a buckle in the jet stream will allow the first real shot of cold air this season to push into parts of the continental United States next week. While somewhat-cooler conditions could reach the Carolinas, it looks for now as if the really chilly stuff will be confined to areas northwest of the Charlotte region. But the configuration of the cold air outbreak could provide a hint of what is to come this winter, if you believe some of the long-range forecasts. It has been a mild month so far for the Midwest and much of the East. Temperatures this month in places like Chicago and St. Louis have averaged 6 to 7 degrees above average. In the Charlotte area, temperatures have been only a few degrees above average. All that appears likely to change. Low pressure in Hudson Bay and high pressure south of Greenland could provide a blocking pattern like the kind that bring bitterly cold air and snowstorms to the central and eastern United States in the winter. In late October, of course, there won't be the bitter cold and widespread snow, although parts of the Midwest could see flurries. The best guess now is that the cold air will funnel southward, creating the typical "U-shaped" pattern that we see in blocking situations. Areas above the outline of the letter U will be in the cold air. That jet stream dip will come southward from Canada into the Dakota, then down across the Midwest, bottoming out in Tennessee and then curving northeast across Virginia and the Mid Atlantic. If that happens, say goodbye to the growing season in much of the Tennessee and Ohio valleys, along with the Great Lakes. Nearly all of the Carolinas would stay on the milder side of the cold air outbreak in that scenario. I've seen a couple long-range winter forecasts that predict the same general pattern from November through February. We'll talk more about that in coming days. Most people describe autumn as cool, crisp days with sunshine in a deep blue sky. But take a look out the window this afternoon. See those grey skies? Step outside. Feel that northeast breeze with a bit of a chill in it? That's how you know autumn has arrived. A look at the weather map confirms it. Low pressure is moving up the coast. Gale warnings are displayed along the Carolinas shoreline. Between 2 and 3 inches of rain are expected near the coast, in places like Myrtle Beach and Wilmington. It's not a strong nor'easter, but it's a good facsimile. And it's a sign that autumn weather is taking hold in the Southeast. Here in the immediate Charlotte area, the coastal storm will bring cloudy skies and a few showers through Wednesday night. Temperatures will be held in the 60s during the daytime -- about 20 degrees cooler than those summer-like readings we experienced last weekend. Tropical Storm Karen was a meteorological bust. Just about the time that tropical storm warnings and hurricane watches were issued for the Gulf coast late last week -- and I began writing about the threat that Karen would bring to the Charlotte region -- the storm was ripped apart by southwest shear. But a bit of Karen lives on. Some of the moisture drifted across Florida and formed an upper level low pressure system this week along the Atlantic coast. Now that low is drifting slowly northward, staying offshore but spreading wind and rain inland. It's a taste of what will be coming later this fall and winter. By late Thursday and Friday, the coastal low finally will push out to sea, off the Virginia coast, and weaken. Sunshine will return to the Charlotte region, and high temperatures will be back in the 70s. In the meantime, you're getting a chance to wear those autumn clothes for the first time this season. And there's a chance the kind of weather we had late last week, with highs in the mid 80s, won't be seen around here again until later next spring. Our surge of late-summer weather has a few more days left in it before whatever is left of Tropical Storm Karen affects some portion of the Carolinas. If you were looking for one of those crisp autumn weekends, this isn't it. The good news is the weather won't get in the way of any outdoor events. It'll be shorts-and-T shirt weather at high school football games Friday night, and you'll need sunscreen and plenty of water if you're planning to attend a daytime college game Saturday. The typical Saturday morning events -- youth sports, golf, tennis, festivals -- will go off without a hitch. We're looking at plenty of sun and daytime temperatures in the middle 80s. Those temperatures are about 10 degrees above average for this time of year, although they're not in the record-level category. Sunday will be the transition day. It will be dry, for most people, and the warm weather will continue. But a cold front will be approaching from the west, and tropical moisture from Karen will be surging north from the Gulf of Mexico. That will mean a steady increase in clouds during the day. A few showers could develop, mostly to the west of Charlotte. That sets the stage for Karen. -- A slowing down of Karen's movement. The storm is not expected to make landfall on the Gulf Coast until early Sunday. That's about 18 hours later than what we thought yesterday. 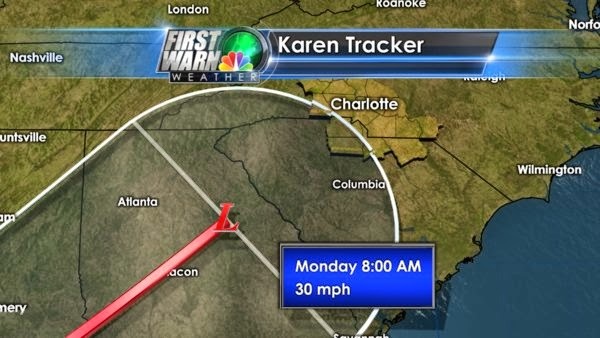 -- An increasing chance that Karen stays south of Charlotte. This is related to the previous point. The storm's remnants are expected to merge with the advancing cold front. On a faster track, that merger would have taken place Sunday, and Karen's remnants would glide up the front, across the western Carolinas. But if it happens later, which looks increasingly likely, the front will be farther east. The latest National Hurricane Center forecast track shows Karen moving northeast across Georgia and then taking something of a right turn across South Carolina. Either way, the Charlotte area stands to get rain and breezy conditions Monday. I had some spare time Thursday and looked at the archives, to see what a track across South Carolina would mean. Often, it means the heaviest rain falls well south of Charlotte. But Jake Wimberley of the National Weather Service's office in Greer, S.C., noted that when Hurricane Ida followed such a path in 2009, it brought 3 to 5 inches of rain in much of the area. We'll keep an eye on this through the weekend. In the meantime, enjoy summer in October. Tropical Storm Karen, which formed Thursday morning in the Gulf of Mexico near the Yucatan peninsula, is headed for the Carolinas, according to nearly all the weather models. But the exact track of what's left of Karen will play a huge role in determining how much of an impact is felt in the Charlotte region. 1. The precipitation from Karen will arrive in Charlotte late Sunday and continue into early Monday afternoon. 2. Several weeks of dry weather will put a limit on any flooding potential in the region. Otherwise, there are a lot of unknowns. The National Hurricane Center expects Karen to rapidly reach hurricane strength by Friday morning, then weaken as it approaches the Gulf Coast. The weakening will be due to wind shear and an intrusion of some dry air from Mexico. But Karen likely will be a strong tropical storm, possibly with 60 to 70 mph winds, when it makes landfall early Sunday somewhere between the Florida panhandle and extreme eastern Louisiana. The National Hurricane Center's official forecast track carries the storm northeast, along an advancing cold front, across Georgia and the western Carolinas, a short distance west of Charlotte. But the GFS model forecasts a more easterly track. If the GFS were to verify, the heaviest rain and the threat of severe storms would remain east of Charlotte. But the Hurricane Center's track would put Charlotte, and the area east of southeast of the city, in the bulls eye. At the minimum, the Monday morning commute in Charlotte will be soggy.